A long term foster local home is required for Rowan a standard Poodle 8 years old female. Rowan has Addisons disease which is stable and controlled with injection every 25 days plus monthly blood test to monitor levels. She requires a stable home and she mixes well with other dog outside, but she requires a home as an only pet. 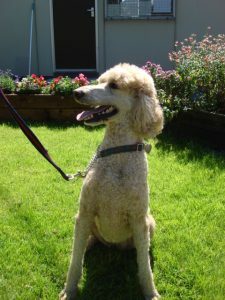 She is a standard apricot poodle, very loving, house trained, with lots of energy. Medication and test for her condition will be assisted with by ourselves. We have to say she is having a great time and is a joy to all who meet her. She enjoys playing in a large garden with her toys but loves people, she has not lived with children so perhaps older children or a adult home may be more suitable for her needs. If you would like to sponsor/ or donate towards Rowans life long medication and regular blood test please contact the rescue.